That’s why the Asylum is sending a small crew to Cambodia to shoot what could be the hottest drafting opportunity title of the holiday season: “Age of the Hobbits.” If all goes well, the disc will be stocked in Redbox kiosks before director Peter Jackson’s”The Hobbit” hits theaters in December. Yes, a Hobbit mockbuster! Filmed in Cambodia, of all places! Age of the Hobbits has the potential to be awesometacular! Speaking of awesometacular, the Air Bud/Air Buddies series has given us 12 entries so far (including spinoff films) but what it hasn’t produced is a wave of immitators that have staying power. 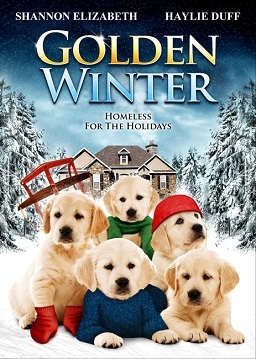 That may change when The Asylum comes to town, because they’re also doing their own golden retreiver puppies series, Golden Winter! And thanks to the winter theme, it can easily be sequelized to different seasons without missing a beat! Featuring Shannon Elizabeth and Haylie Duff, the film will feature a kid who befriends some puppies and then they stop a bank robbery. Maybe this will be puppy Home Alone too? Tom Seidman writes and directs. Clearly Haylie Duff proves she’s the superior Duff sister. No, that wasn’t a joke, by the way. She voices Rory the puppy leader. We're not buddies, in fact, we all hate each other and you!